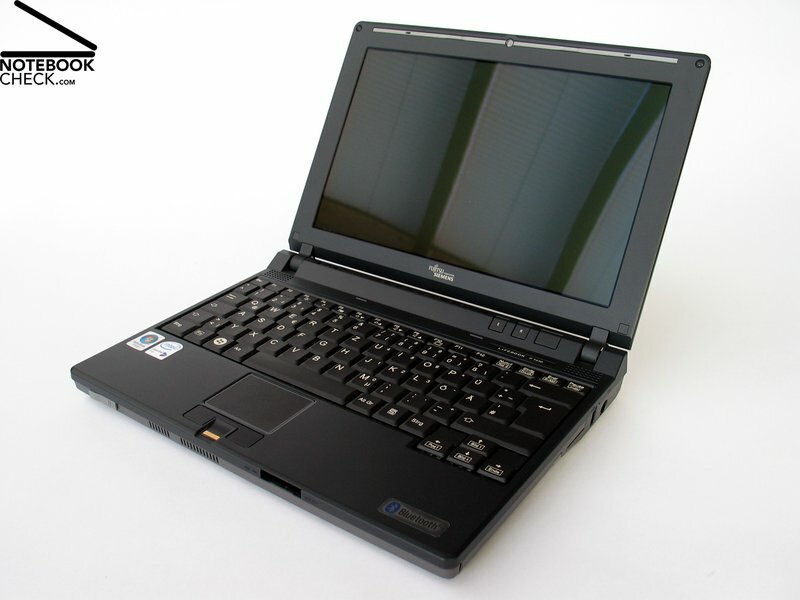 Optical drives and proper energy supply are usually the first victims in the battle for the smallest subnotebook. 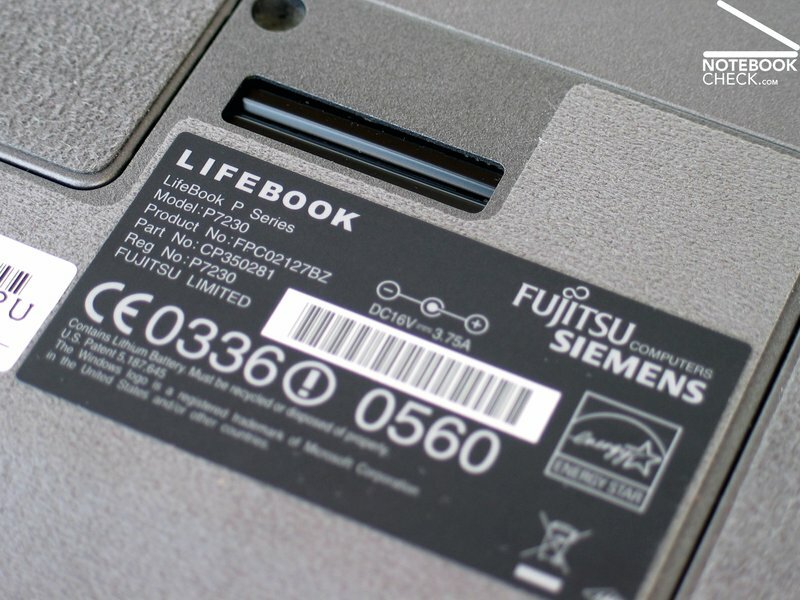 Fujitsu-Siemens tackles exactly this problem, and offers with the Lifebook P7230 an ultra mobile 10.6 inch subnotebook with extensive communication-features and a DVD burner that can be replaced with an optional additional battery. 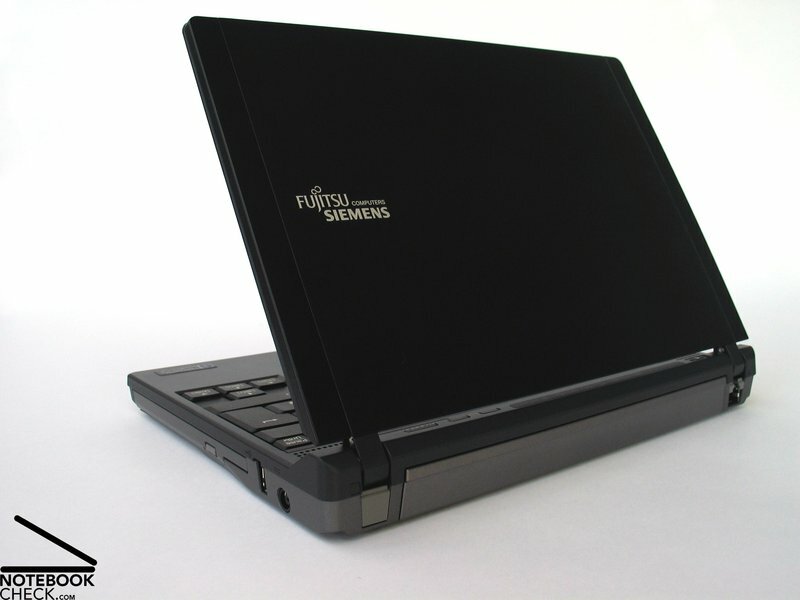 Fujitsu-Siemens (FSC) followed the classical business design standard with the P7230, which means few colours and strictly conservative shapes. However, the result is still attractive. The notebook appeals with a clear case design that conveys stability and durability. The lower part is coated in dark grey and appears slightly metallic due to it's raw surface. In fact, it doesen't just appear metallic. 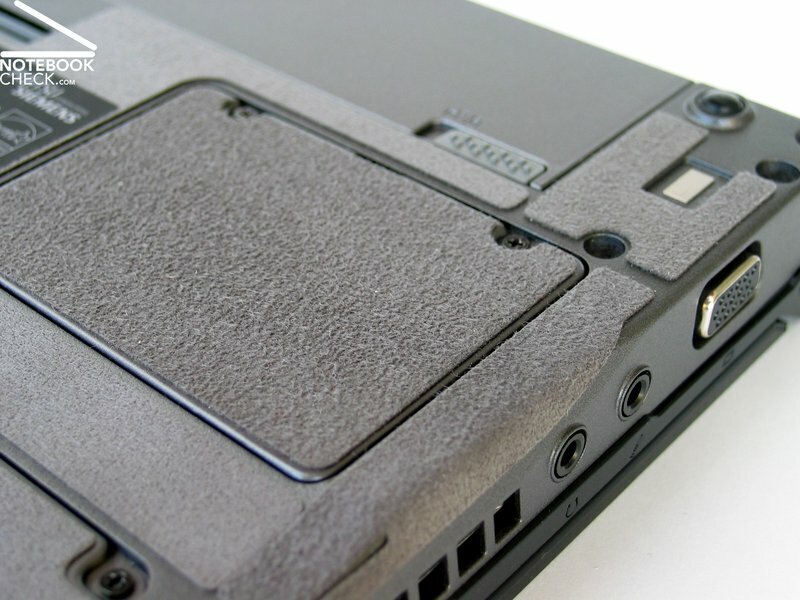 After closer inspection and touching the surface or when opening the maintenance lids at the bottom of the case, it becomes clear that the material is actually metal. Fujitsu-Siemens lists magnesium as material, which combines low weight with excellent stability. 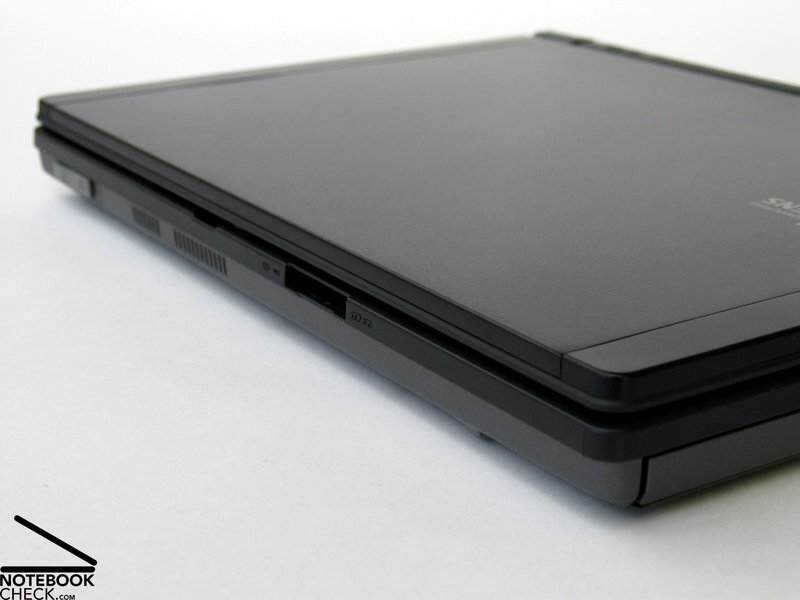 Furthermore, all the surface parts of the P7230 are made of magnesium. 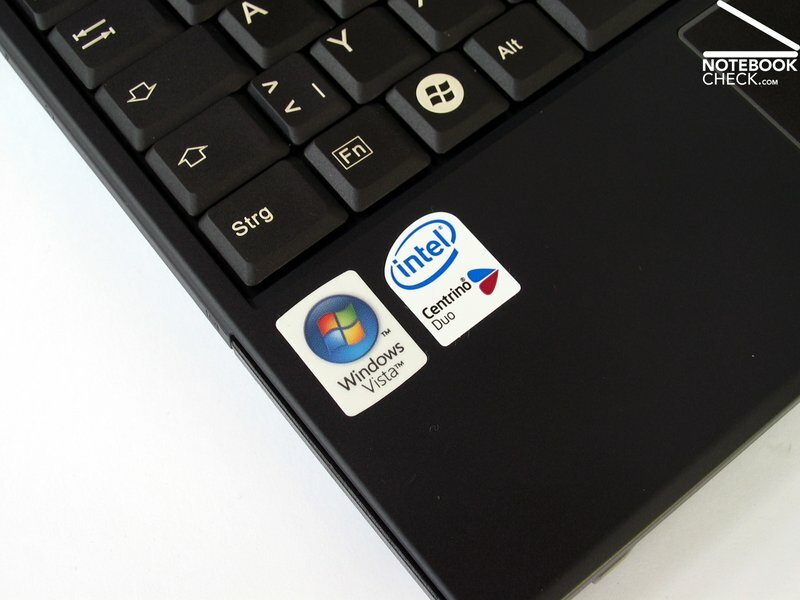 This significantly boosts the Lifebook P7230's haptics rating. The lower side of the notebook is special regarding feel of the surface as well. With the exception of the battery, almost the entire bottom side is covered with a textile similar to raw leather. This does not only feel pleasant, but helps to keep the felt temperatures down, which comes in handy if the notebook is used on the lap. 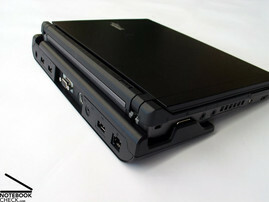 The case stability of the Lifebook P7230 is thus excellent. The subnotebook makes a robust impression when handled. Although small case deformations are noticeable if pressure is applied to single points, this shouldn't be a problem in practice. 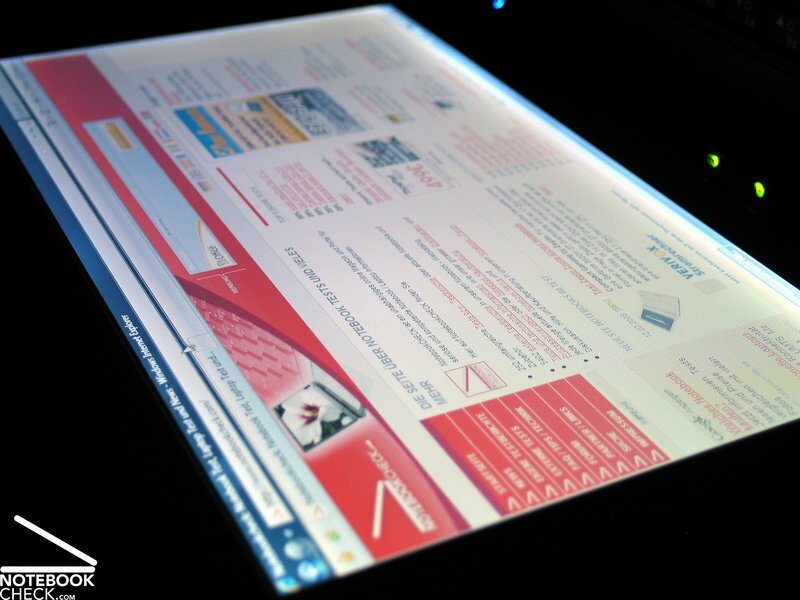 Although the display is due to LED technology very thin, it is very flexural rigid. Modest pressure on the display lid can be absorbed as well. However, it isn't really recommended to transport the notebook in a suitcase together with other items, unless the included protective cover is used. The cover not only protects the notebook from possible damages, but also from fingerprints which otherwise accumulate over time on the display lid. Both display hinges appear robust and easily keep the slim LED display in position. 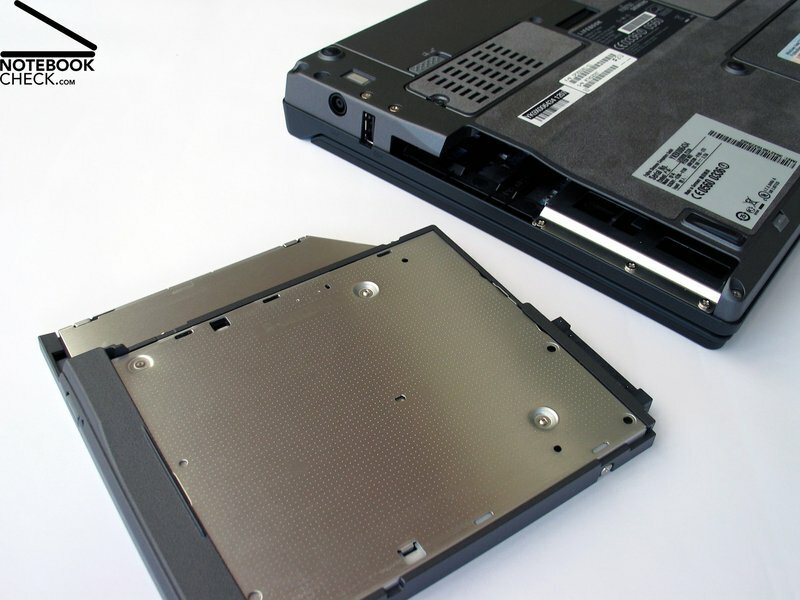 No wobbling is noticeable, which has a very positive impact on the possible usages of the notebook. There is no transport hook that keeps the display closed, which is another reason to transport the P7230 in the protective cover. 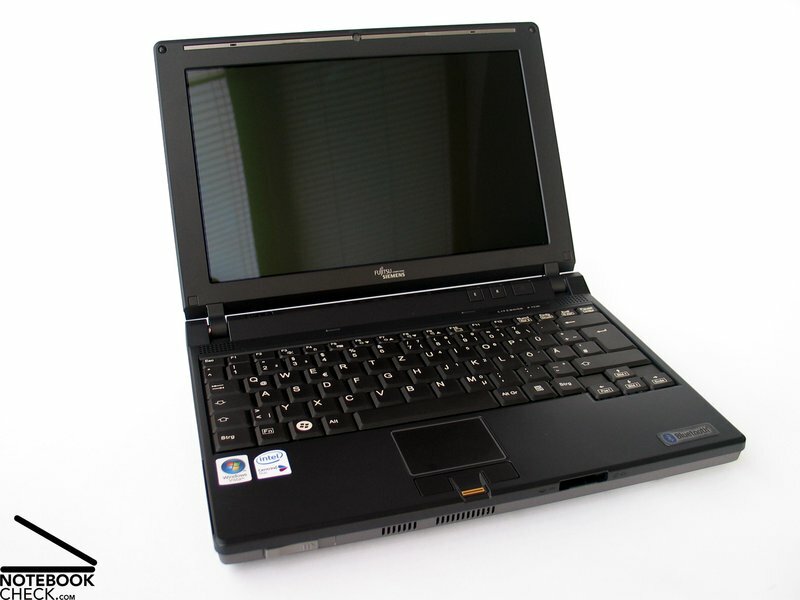 The Fujitsu-Siemens Lifebook P7230 offers only limited interface equipment with proper arrangement for mobile usage. 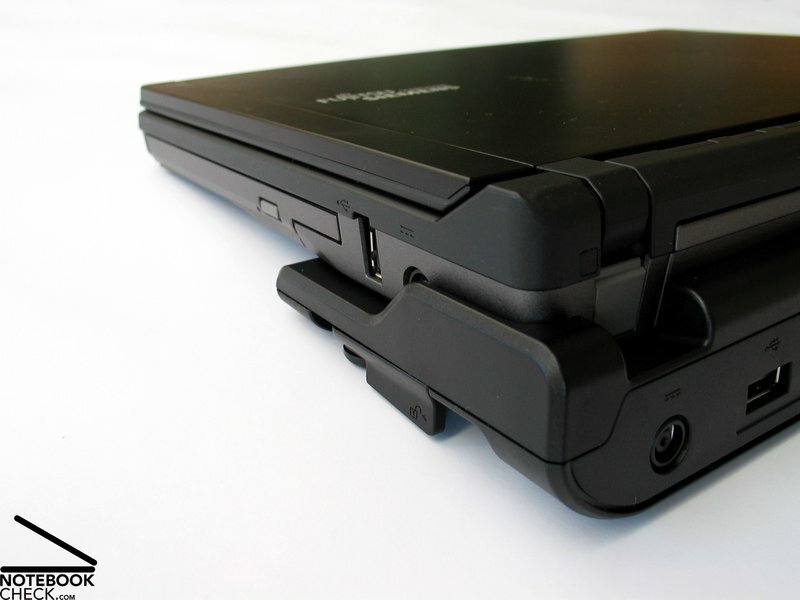 A docking port at the bottom side of the notebook makes it possible to enhance the notebook's interfaces with various other connections. All that is needed is a suitable docking station from Fujitsu-Siemens or the port replicator which is included in the shipment. This is perfect to integrate the notebook in an existing office environment. 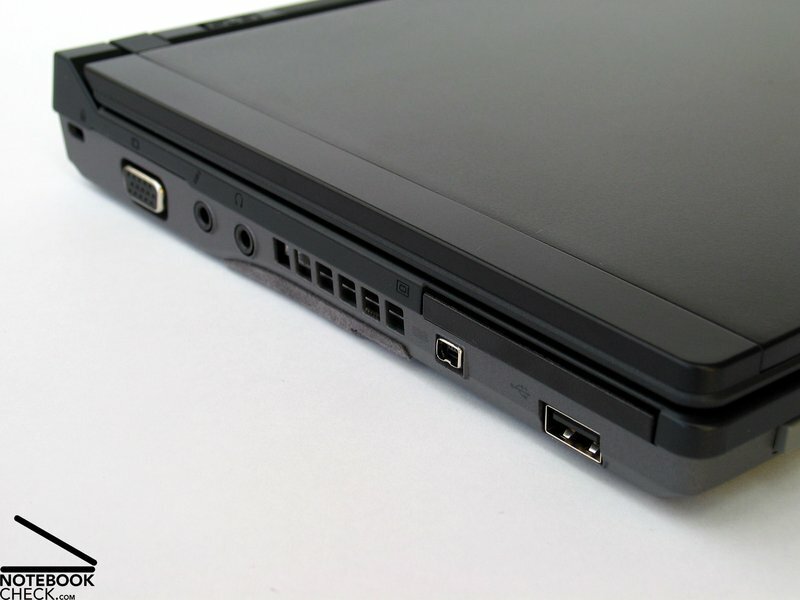 The notebook's directly built-in interfaces consists of two USB 2.0 ports at the front left side, respectively at the right side behind the DVD drive, as well as a Firewire port, 35mm input jacks for earphones and microphone, a VGA connection to connect the P7230 to a beamer or a monitor, and a Kensington lock in the corner. The RJ45 LAN port is the only interface at the back of the notebook. There is no modem connection, although it looks like it was once envisaged, due to the additional plastic cover at the back. 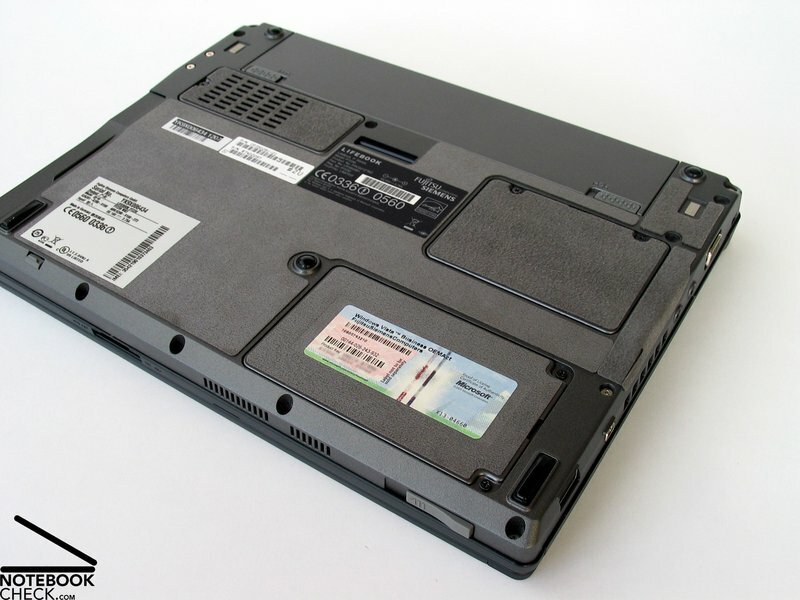 The P7230 offers furthermore a PCCard type I/II slot for various extensions, but not an ExpressCard slot. A card reader was integrated at the front edge. The interface alignment turned out to be quite user-friendly during our test, particularly during mobile use. Even the two USB ports should suffice if the docking station is used. 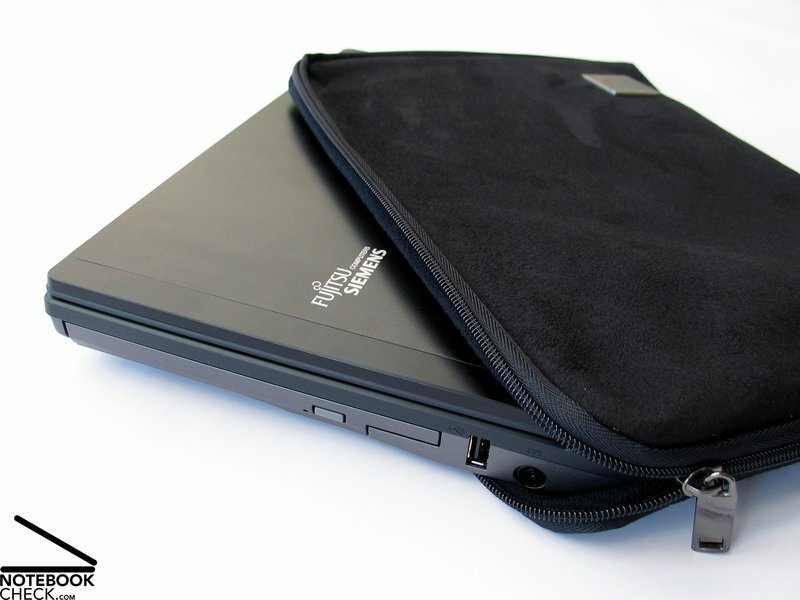 Especially important for a mobile subnotebook are of course extensive communication modules. The Lifebook P7230 offers wireless LAN standard 802.11 a/b/g, Bluetooth 2.0 and an integrated UMTS/HSDPA module, which allows internet access almost everywhere in combination with a contract with a wireless provider. A 10/100Mbit network card by Marvell is responsible for the communication in your private or company wide network. A webcam, which is integrated into the P7230's display frame, allows video meetings. The so called ConfCamera offers a resolution of 1.3 mega pixel. Security is obviously very important for a business notebook. Especially since mobile computers are far more likely to be stolen than their desktop counterparts, the importance of data security should never be underestimated. 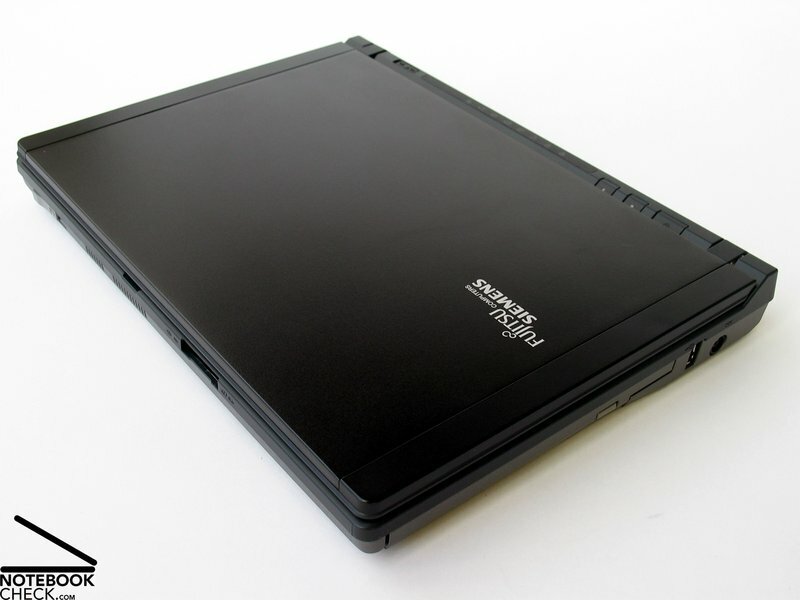 FSC equips the Lifebook for this reason with a Trusted Platform Module (TPM) 1.2, which can encrypt data. Additionally, the P7230 offers a fingerprint reader to control access. That is not all. 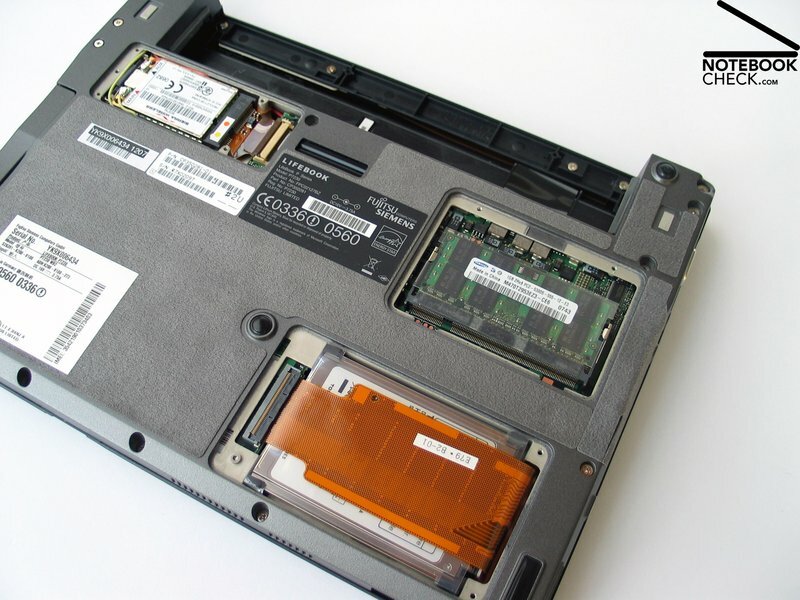 The notebook also contains a shock sensor, which recognises sudden movement in all three axis and removes the write-read head from the hard disk if necessary to avoid possible data loss. Another useful feature is Fujitsu-Siemens recovery function, which can be started with the "R" key. It allows to quickly backup and restore data. It is also possible to set automatical backup to other drives or over network, which is very handy. Included with the shipment is also a recovery DVD, various driver DVDs as well as a suitable port replicator for the Lifebook. 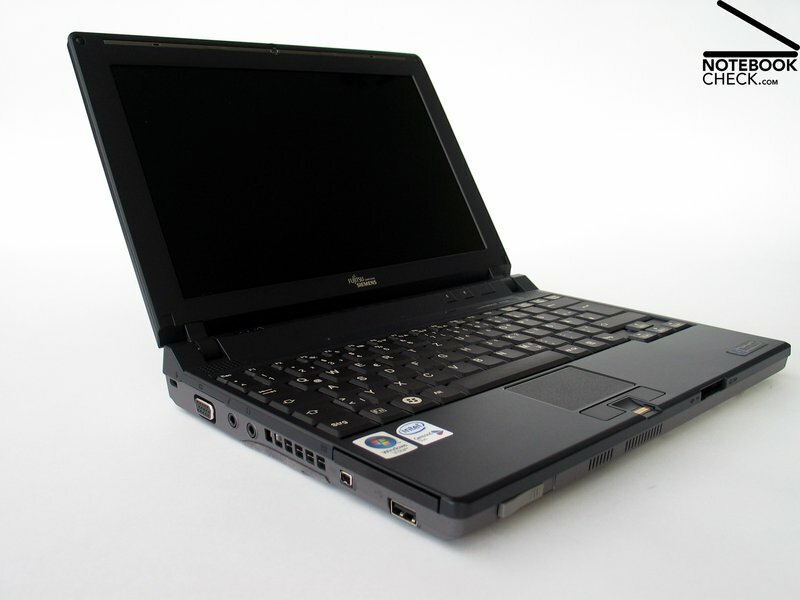 The latter extends the P7230 by three additional USB ports, a VGA and a S-video port and also makes the notebook stand slightly inclined, which actually has a positive effect while typing. However, a digital visual interface (DVI) is not included in the port replicator. Another thing in the shipment card box was a well cushioned protective wrapping for the P7230. 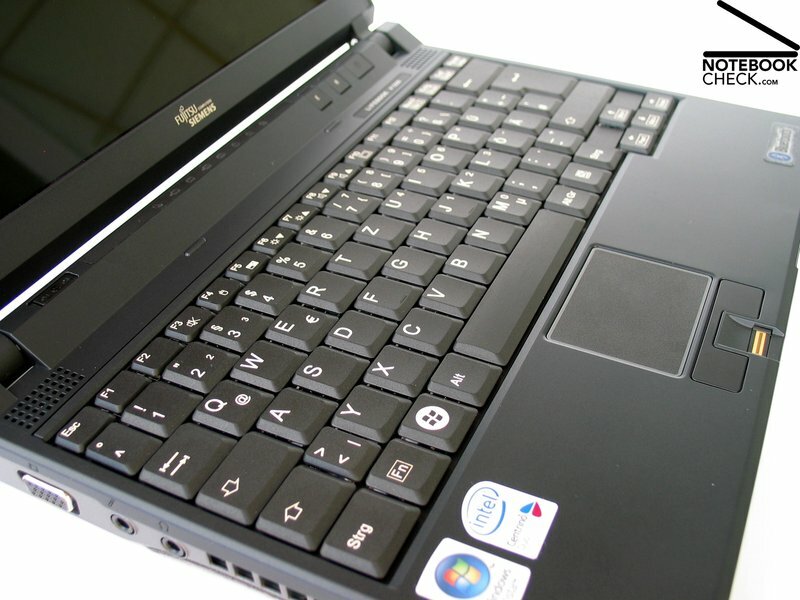 Due to the Lifebook's compact 10.6 inch format, FSC had the challenging task to build a fully fledged keyboard with a width of less than 27.3 centimeter. This feat was achieved by reducing the size of the standard keys to 1.7x1.5 centimeter. They are still big enough for comfortable touch typing, and there was enough space left to offer a two row Enter key as well as Shift, Space and Backspace in adequate size. 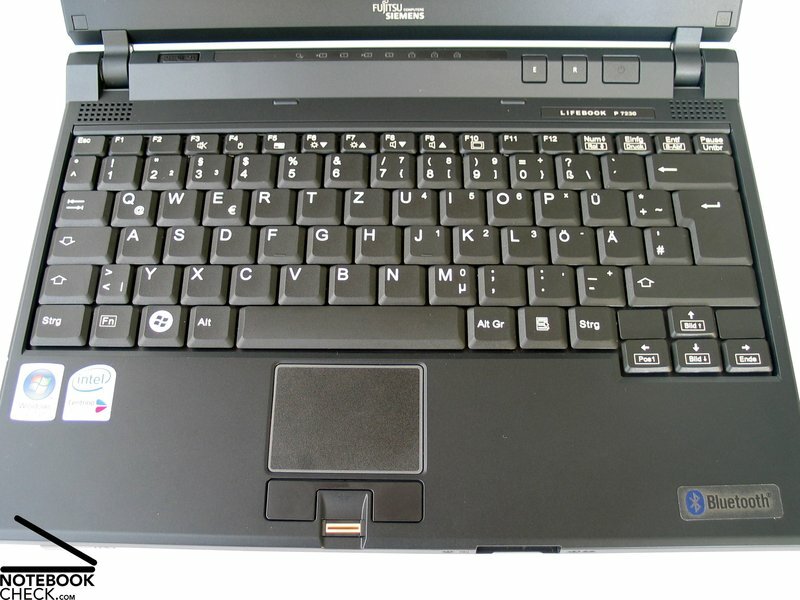 The keyboard layout is mostly similar to the standard keyboard. Annoying mental adjustments and lots of getting used to are fortunately not necessary. The cursor keys were slightly moved down and so separated from the other keys. Their size is similar to the F-keys and the function keys like delete and insert, which are located in the same row. Some precision is required to avoid accidentally hitting several keys at once. Typing is rather pleasant. Noticeable is the early and clear feedback, which causes a slightly jerking feeling. 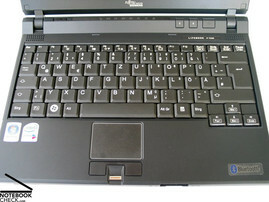 The keyboard also bends a little under pressure or vibrates when typing more forcefully. However, these effects weren't strong enough to be negatively noticeable in our test. 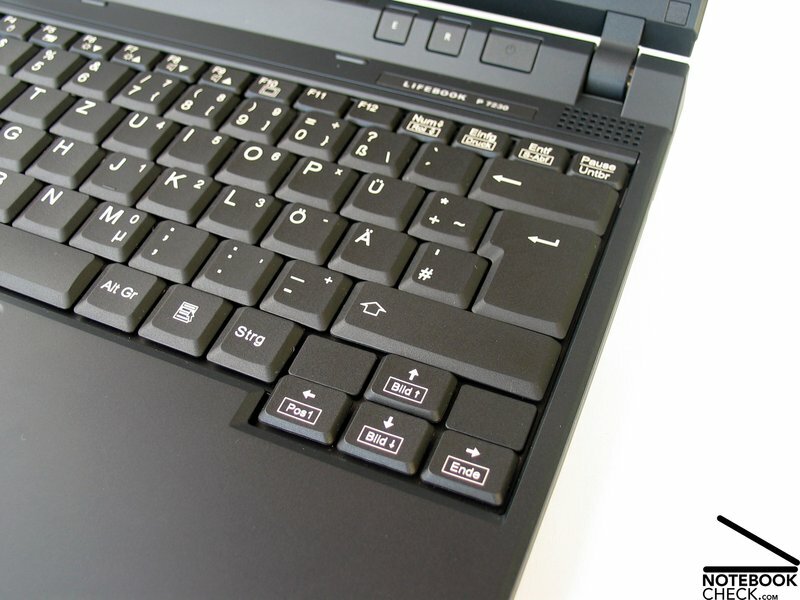 The only hot keys keys the FSC P7230 offers are the already mentioned R- and E-key. The R stands for recovery function, while the E is the so called EcoButton that starts various energy saving functions. More about the EcoButton in the section about battery runtime. 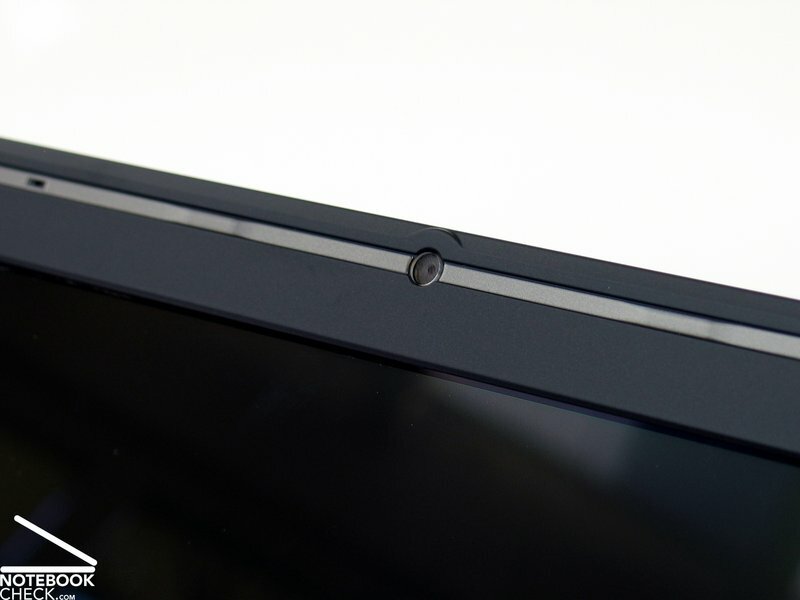 The P7230's touchpad has a very pleasant surface, but doesen't offer a scroll area, neither horizontally nor vertically. It is very responsive and it allows to move the mouse pointer precisely. We couldn't quite get used to the two touch buttons however. They are rather small and offer almost no click-feedback to the user. The 10.6 inch display offers a WXGA resolution of 1280x768 pixel. This is enough to use all office applications without restriction and to keep track of everything that is going on. 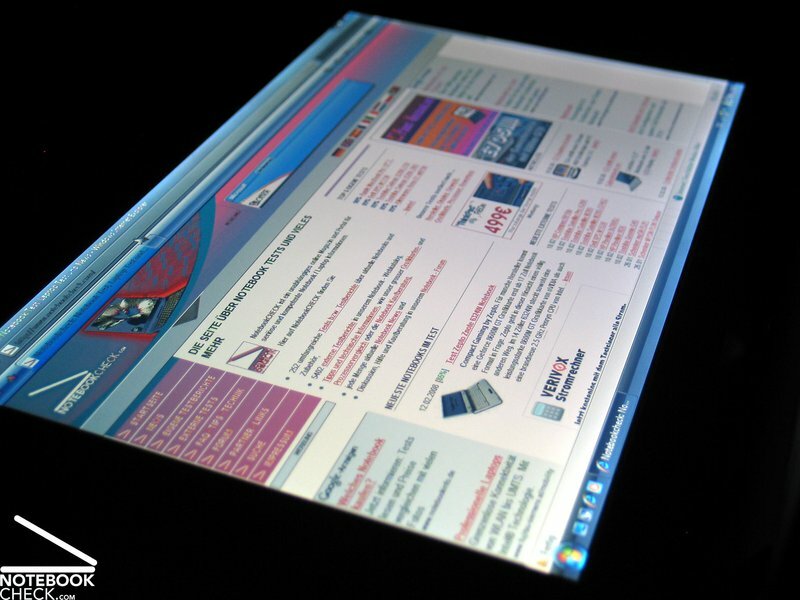 Unfortunately, it is a glossy display that reflects a lot in bright environments. Furthermore, the display has a LED background illumination that provides good brightness and a very homogeneous illumination. Low power consumption is another advantage that makes this technology very suitable for mobile subnotebooks. The maximum brightness test with the Gossens Mavo display tester, resulted in very good 244cd/m2 in the central display area. The homogeneous illumination of the display, which is due to a minimum brightness of 226cd/m² and the maximum brightness 92.6% has to be mentioned.The display achieves the same brightness even when running on batteries. The lowest possible brightness of the display (black value) was a measured 1.86cd/m2, a rather high value. Considering the maximum brightness this results in a maximum possible contrast ratio of only 131:1. The image colours look subjectively good. 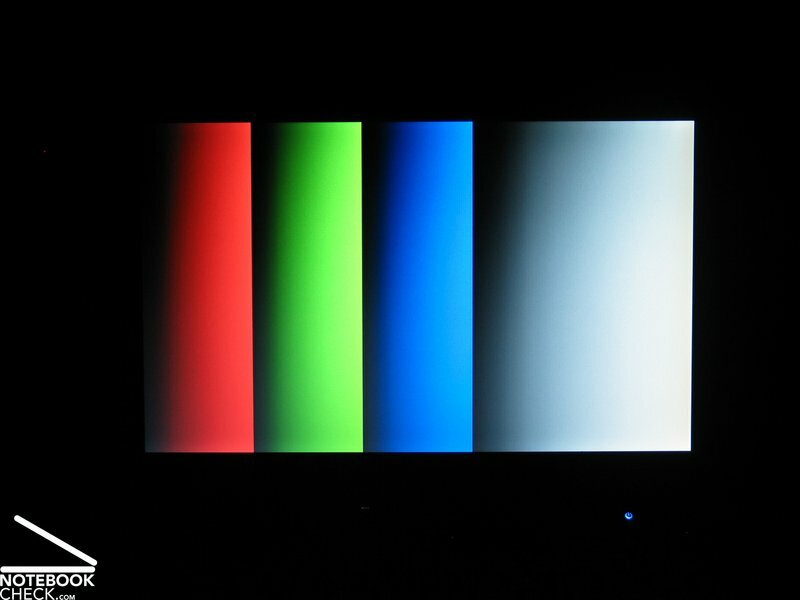 This is supported by the reflecting surface, which emphasises colours. 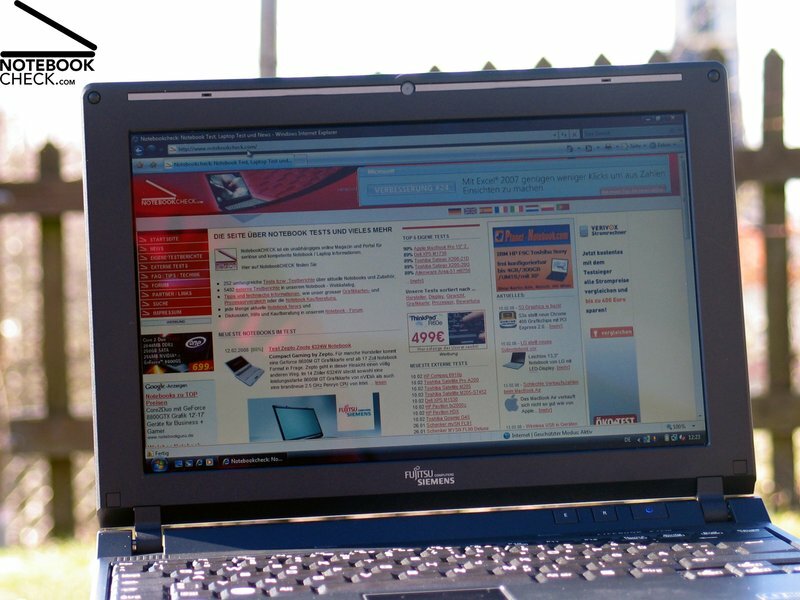 The FS Lifebook P7230 does generally well in our outdoor capability test. Especially the excellent brightness provides good readability even with very bright light sources. A disadvantage in this respect is certainly the glossy display, which can cause heavy reflections in unfavourable viewing angles. Regarding viewing angle stability FSC mentiones the "Crystal View Technology", which is supposed to allow a wide viewing angle. This wasn't quite the case in our test however. Although the display's horizontal viewing angles are by and large user friendly, it doesen't allow much room for movement in vertical direction. Even small deviations upwards cause a big loss in contrast followed by a change of the image. 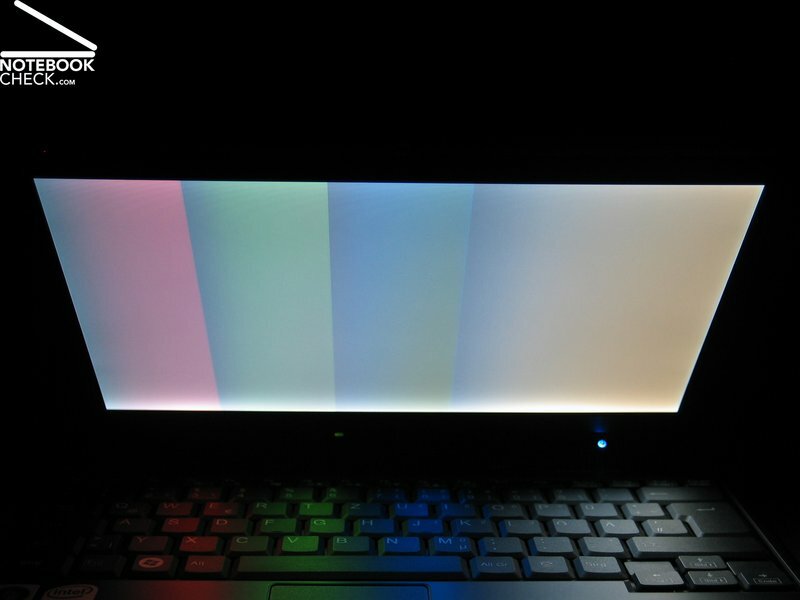 Movement downwards is punished with a quick darkening of the screen. Frequent adjustments of the display angles are thus guaranteed, in particular during mobile usage. 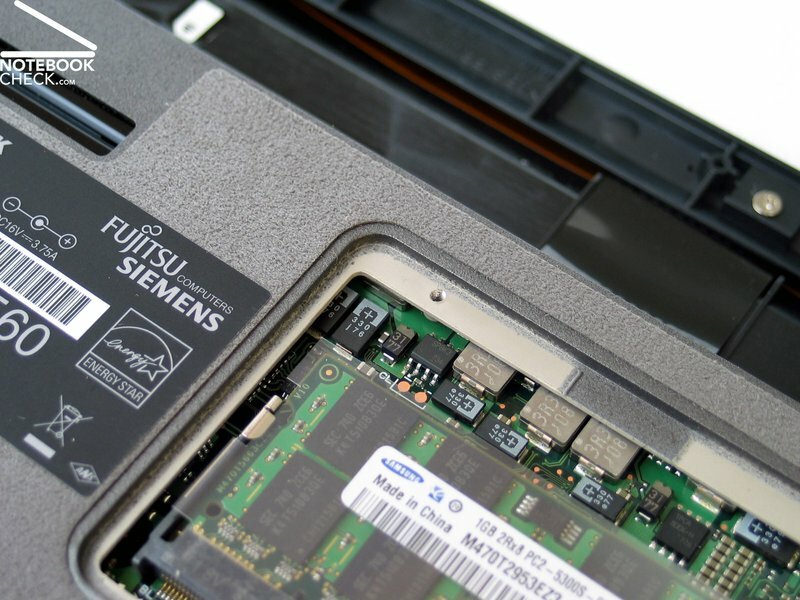 The Fujitsu-Siemens Lifebook P7230's central processing unit is a Core Duo U2500 CPU. 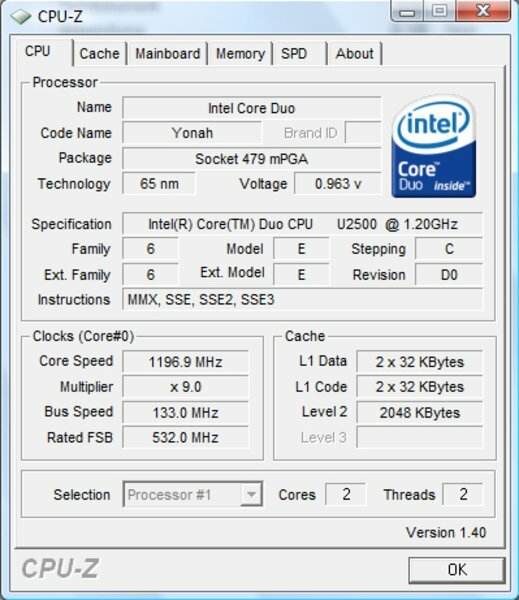 This is a first generation dual core processor made by Intel (codename Yonah), with 1.2GHz clock rate, 2MB L2-cache and 533MHz FSB. The label U2500 means it is an ULV (Ultra Low Voltage) processor version with very low power consumption and low cooling needs. 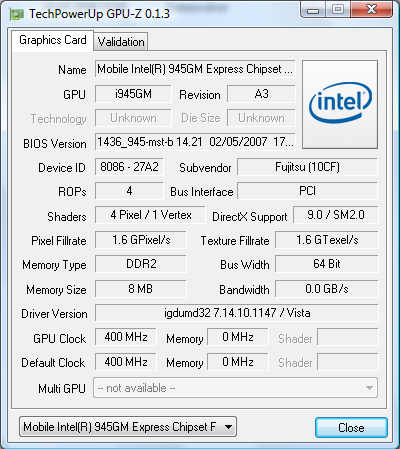 Responsible for graphics output is an integrated graphics chip (Intel 945GM), which is also known as GMA 950 (Graphics Media Accelerator). This graphics solution doesen't have it's own video memory, but instead occupies up to 224MB of the system memory if necessary. 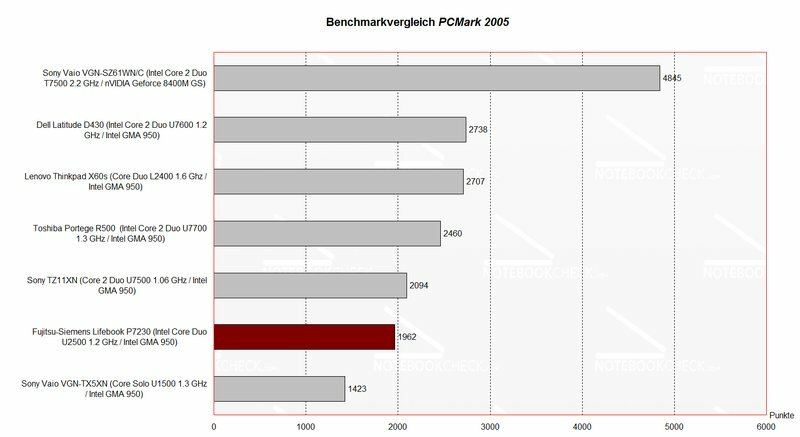 The P72340 doesn't really shine in benchmark comparisons with other subnotebooks. 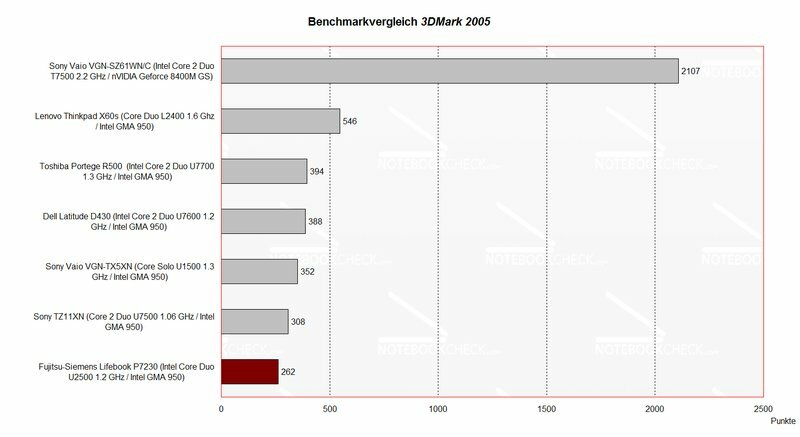 It is slower than it's competitors in 3DMark as well as PCMark. 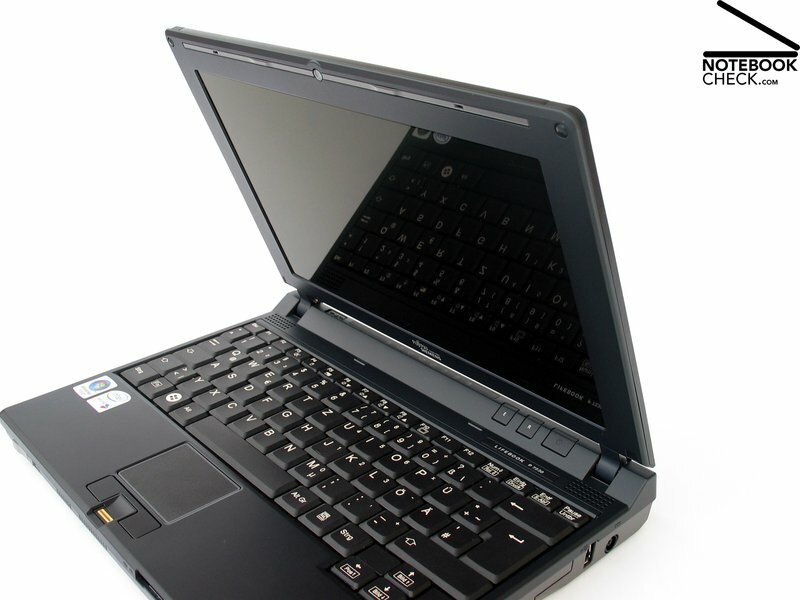 However, computing power is certainly not a reason to buy the Lifebook P7230 anyway, it's strengths are elsewhere. The notebook is optimised for low energy consumption and thus low noise emissions. Despite these priorities, the P7230 offers enough performance for a smooth working experience with Windows Vista, and it can handle standard office applications without any problems. 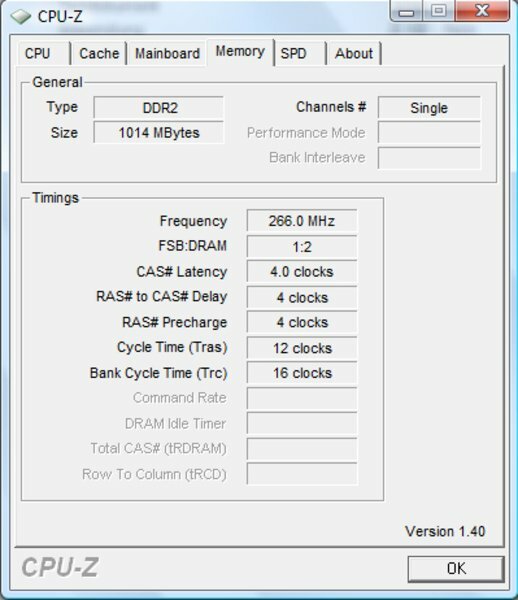 Our test sample was equipped with one gigabyte system memory. 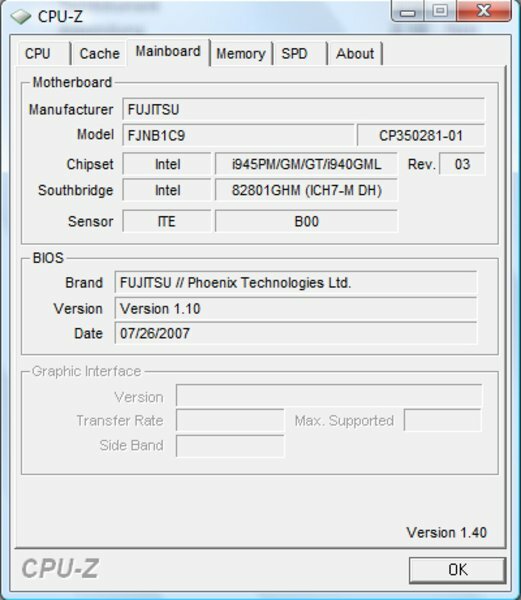 It is possible to upgrade to two gigabyte, but there is only one memory slot available. 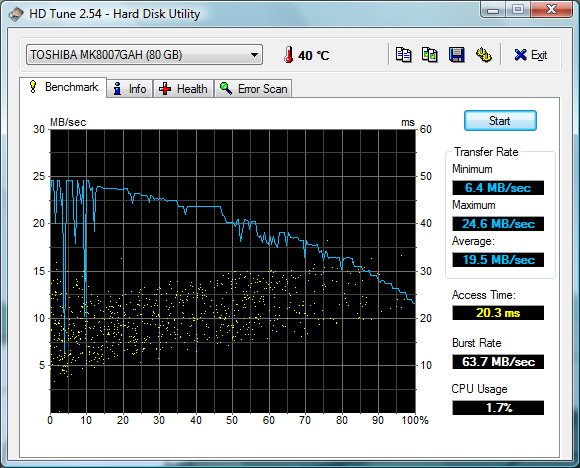 The hard disk is a 80GB Toshiba MK8007GAH with a speed of 4200r/min. The measured transfer rates are rather modest and the access time is with 20.3 milliseconds slightly above average. The advantages of this hard disk are low energy consumption, temperature and power consumption. Therefore it fits seamlessly with the other hardware components. 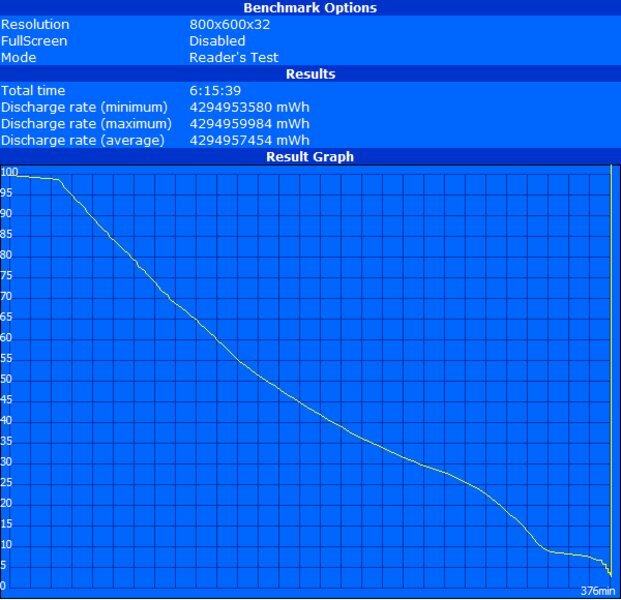 Although the Lifebook P7230 stays mostly silent in idle mode, with only 29.2dB, the fan accelerates in regular intervals for a couple of seconds. The noise level goes up to 41.1dB during that time. Choosing the energy profile "energy saving mode" and/or the activation of the Eco-mode of the notebook didn't change this behaviour. This phenomenon could be observed approximately every 15-20 minutes in WLAN mode on batteries. The fan achieves a maximum noise level of 44.7dB under load, which is remarkable loud. This noise level can be described as very annoying. Noticeable was also a kind of pulsating of the fan under load. Although the hard disk keeps generally very quiet with a noise level of only 31.5dB, it's clicking noise is still clearly audible as long as the system fan is turned off. 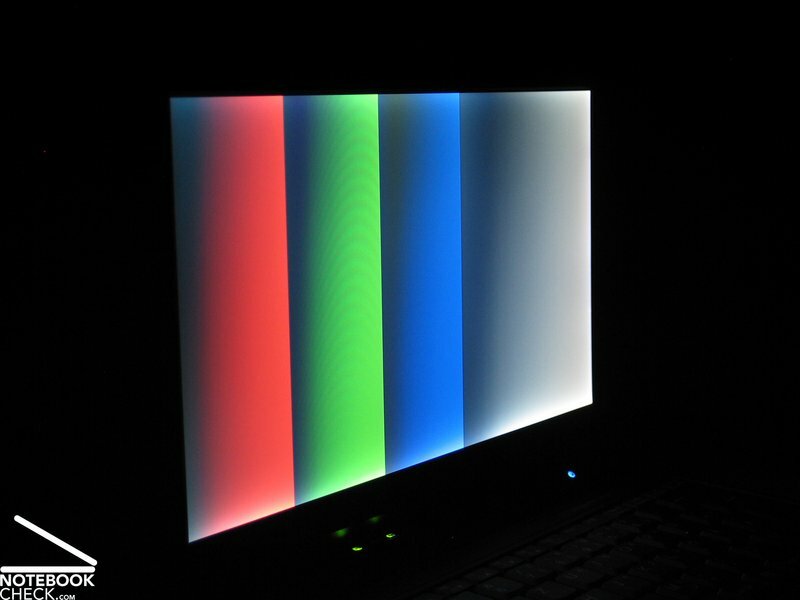 The noise of the P7230was acceptable during DVD replay. The system fan is deactivated most of the time if the notebook runs in energy saving mode, and the movie played with an acceptable noise level of 38.4dB. The subnotebook's focus on low energy consumption has also a positive effect on the temperature measured on the case surface. As a result, the surface temperature on the upper side of the notebook was with 29.3°C always under 30°C. A bit higher are the results at the bottom side of the notebook. Maximal values of 41.7°C near the fan are still no problem however. Additionally, the textile cover on the bottom surface reduces the actually felt temperature. (+) The average temperature for the upper side under maximal load is 27.7 °C / 82 F, compared to the average of 30.7 °C / 87 F for the devices in the class Subnotebook. (+) The maximum temperature on the upper side is 29.3 °C / 85 F, compared to the average of 35.8 °C / 96 F, ranging from 22 to 57 °C for the class Subnotebook. 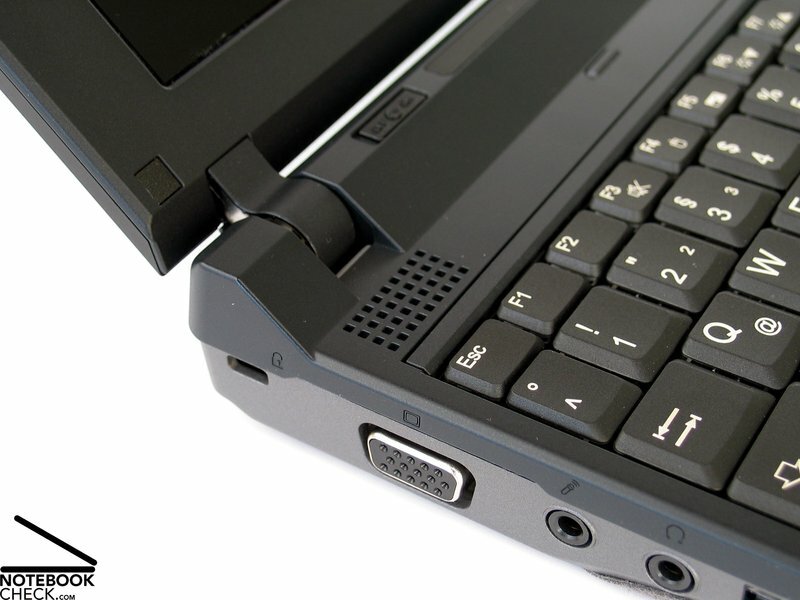 The two integrated loud speakers of the subnotebook are hidden behind two geometrically perforated locations left and right above the keyboard. The sound they produce is seriously lacking and they are not really appropriate for music play back. The highest volume is still rather low as well. Ear phones are recommended for these reasons. The sound quality in the test with a Sennheiser PC130 head set plugged into the 3.5mm stereo input jack was very good, without any static. The Lifebook P7230 is equipped with a 6-cell 5300mAh (56Wh) battery pack, which provides enough power to keep the subnotebook running for a while. In the load-test with the tool BatteryEater (classic test), the measured battery runtime was 152 minutes respectively 2.5 hours. In the Readers test, with maximum energy saving functions (without Eco-mode! 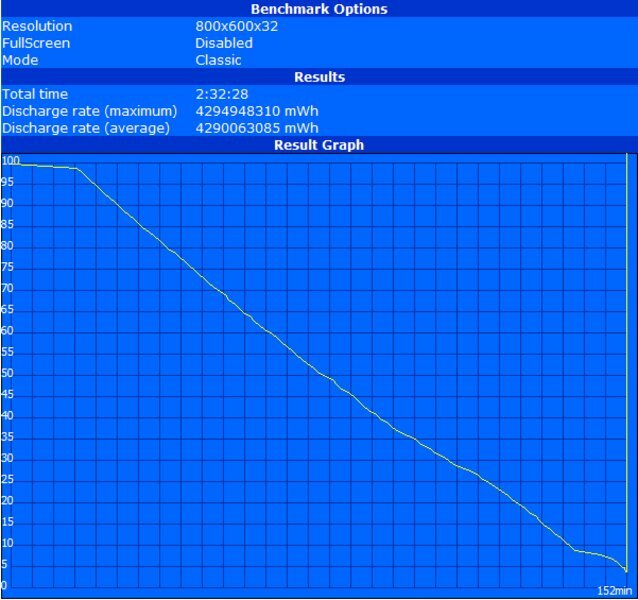 ), the P7230 managed to run for 376 minutes respectively more than 6 hours. However, it is hard to work with lowest brightness and the battery runtime would be shorter if applications were used. 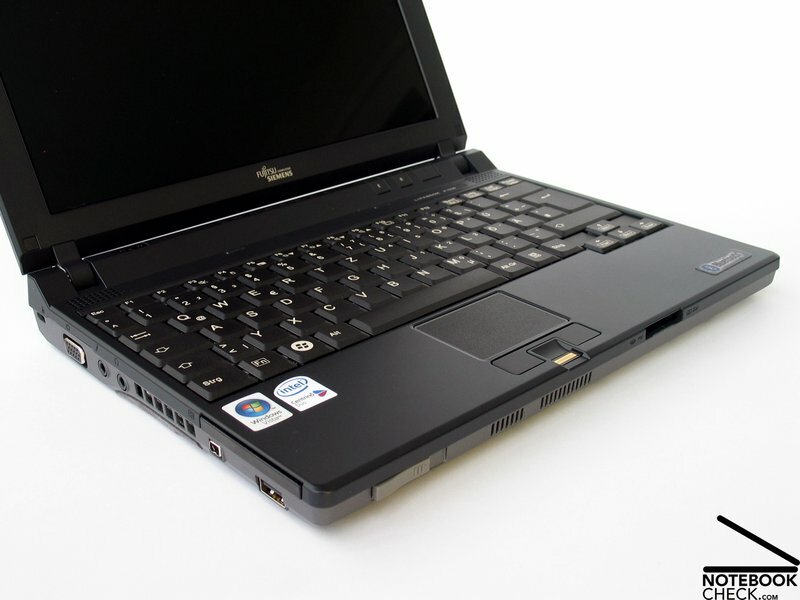 Furthermore, the processor clock rate is lowered to 800MHz while the notebook is in energy saving mode. 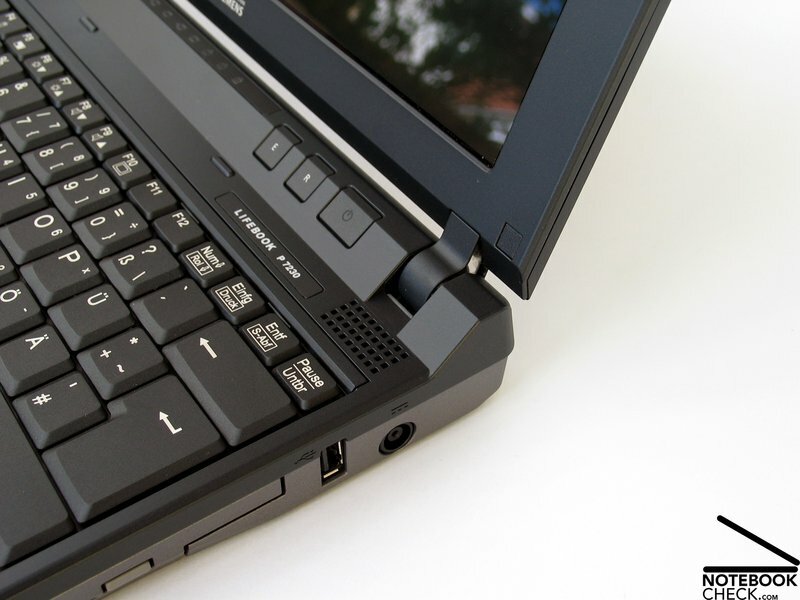 The FSC Lifebook P7230 has two more options to further improve mobility. 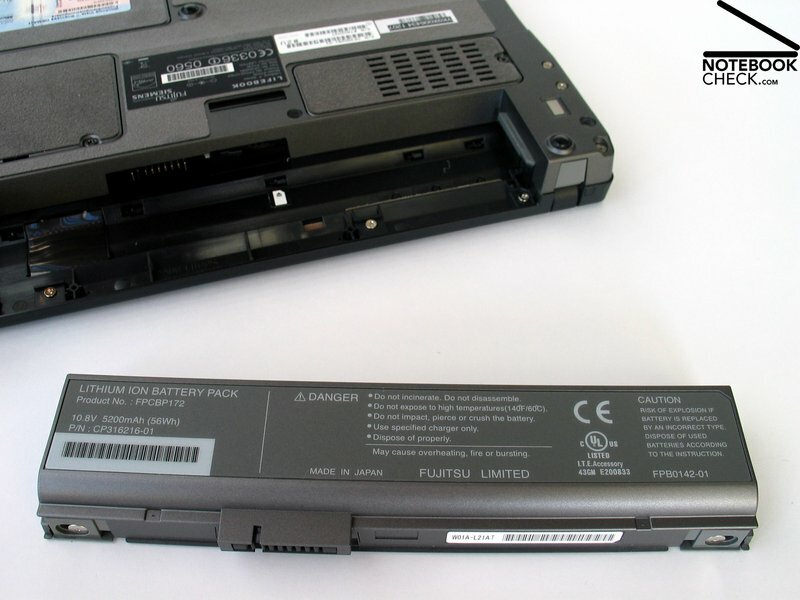 The first is replacing the DVD drive with a second battery. The capacity of the additional battery is 2300mAh, which would extend the total lifetime by roughly 40%. The second option is called Eco-mode, which even got it's own button ("E") from FSC. 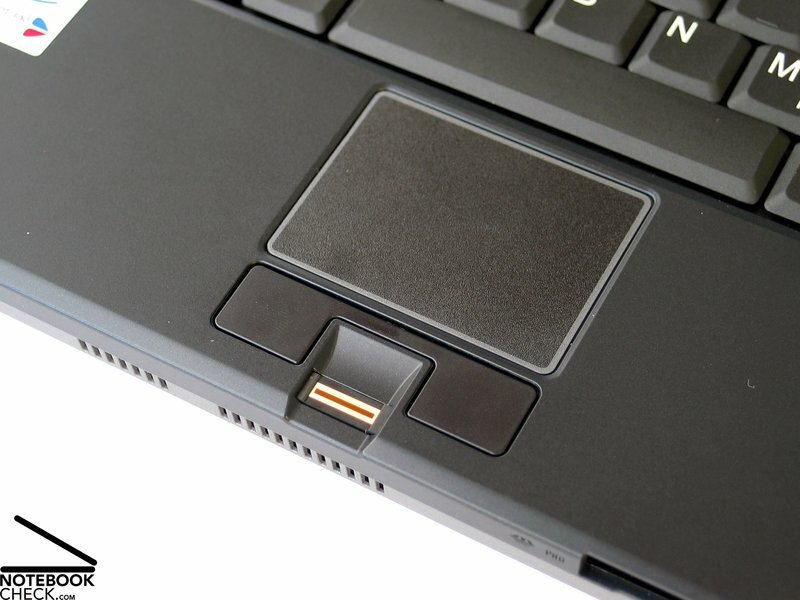 Pressing the EcoButton activates various functions, like deactivating the optical drive, the PCCard slot, the card reader as well as the network card (LAN) and the Firewire port. Furthermore, the brightness of the display is reduced by 4 steps, but that can be undone with the key combination FN+F7 at any time. The measured energy savings with Eco-mode, with the same display brightness as without Eco-mode, are two watt. Considered the minimum power consumption of 18 watt without Eco-mode, this means energy savings of a bit more than 10%. 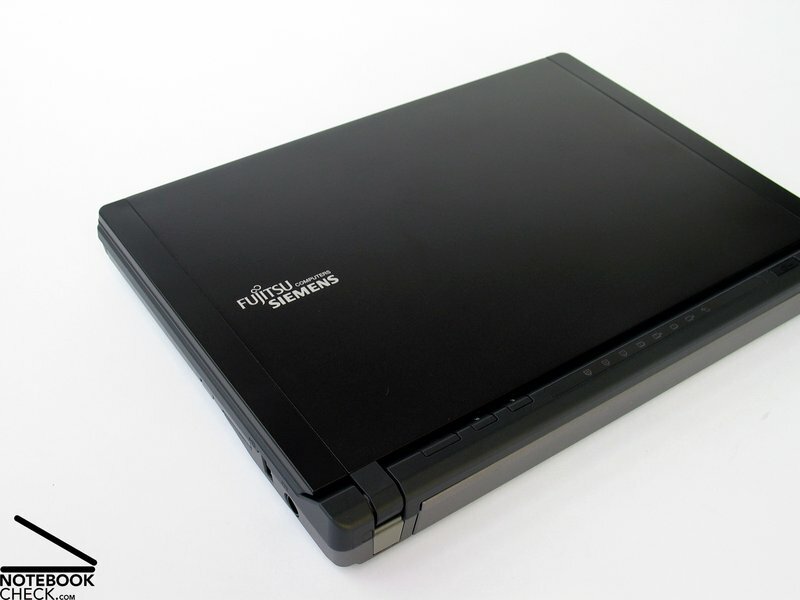 Considering it is an ultra-mobile subnotebook, the Fujitsu-Siemens Lifebook P7230 offers a wide range of helpful features that manage to score in various aspects. 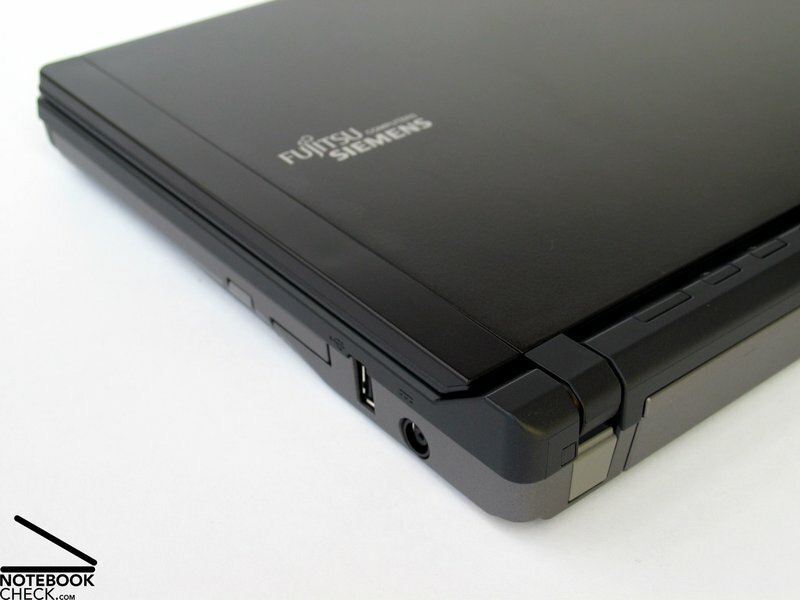 The case, for example, consist of magnesium parts, which not only provide the notebook with an excellent feel to the touch, but also with very good stability. The focus regarding design of the P7230 is clearly on decent black and gray surfaces. 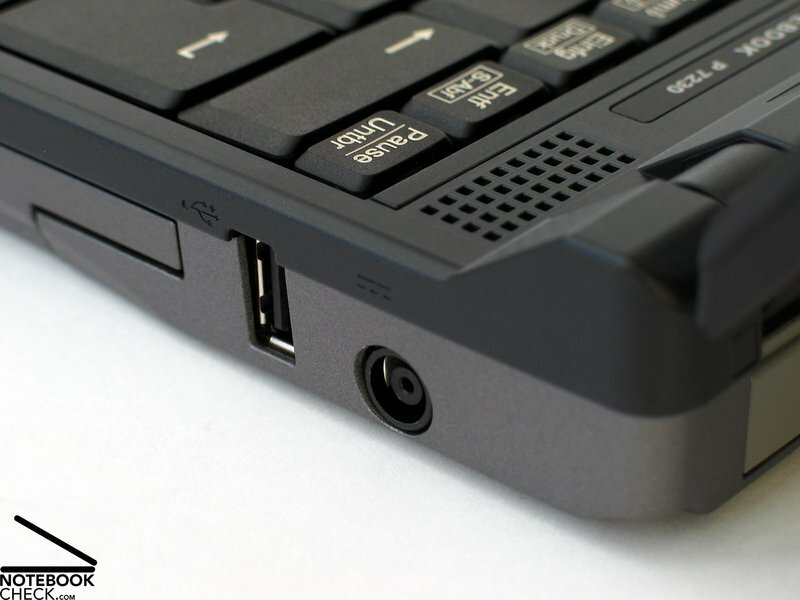 Even though the interface equipment of the notebook is not very extensive, it still offers all necessary ports for a mobile notebook. The included port replicator can extend the interfaces of the notebook and it can be quickly installed in your existing working environment. Another positive point worth mentioning is the UMTS/HSDPA of the P7230. Although there was not much space for a keyboard in the only 27 centimeter wide case, FSC managed to build a fully-fledged and user-friendly keyboard into the 10.6 inch notebook. Only the touch pad and touch keys are rather small. 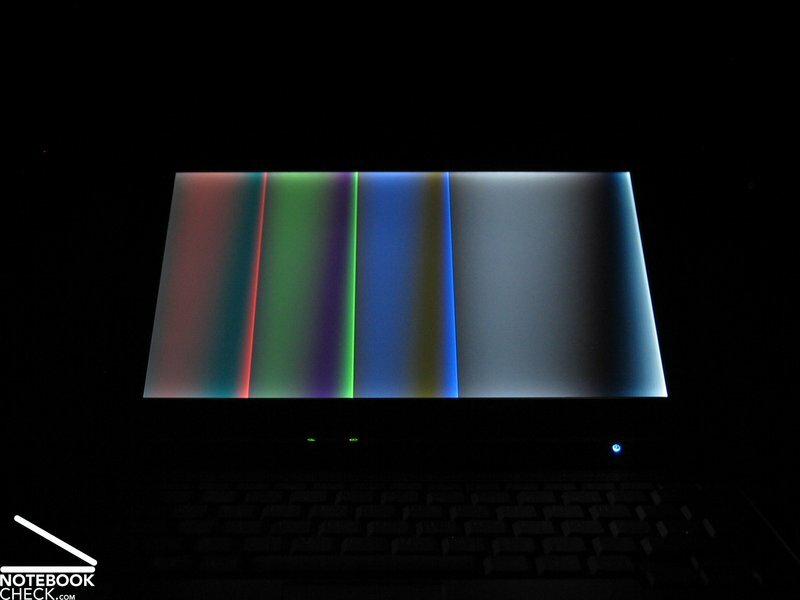 The LED display impressed during the test with a good brightness and excellent illumination (92.6%!). 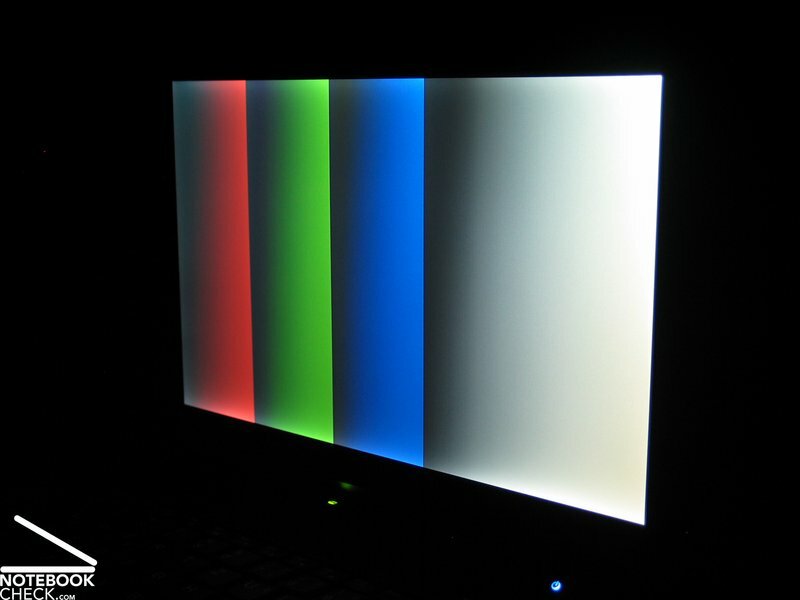 Disadvantages of the display are the reflecting surface that is negatively noticeable during outdoor usage, as well as the low maximum contrast with rather modest viewing angle stability. The performance of the ultra low voltage processor and the integrated GMA 950 graphics are not very exciting. However, it offers enough power for common office applications and is easy on the battery. 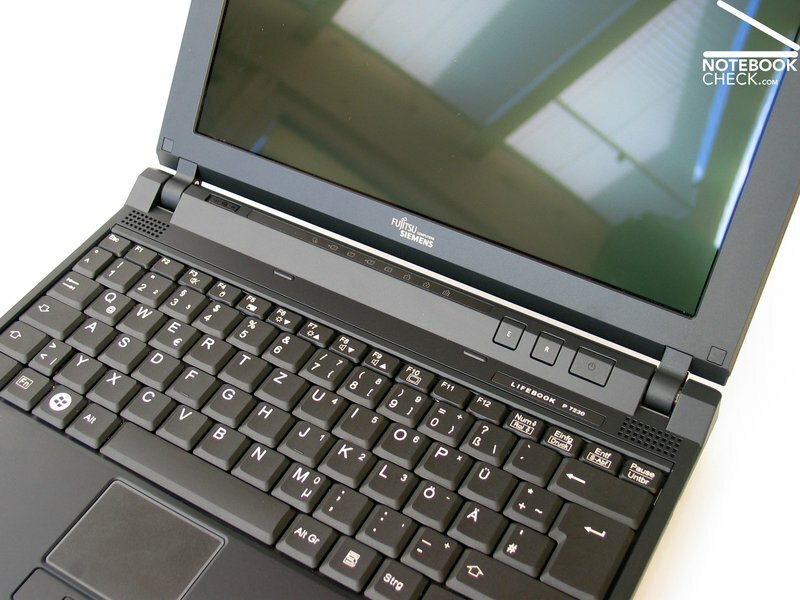 The low temperature and noise emissions of the Fujitsu-Siemens Lifebook P7230 are another important advantage of the notebook. The same is true for the long battery runtime and the option to add an supplement battery in case of very high mobility requirements. We would like to thank Planet Notebook, who kindly provided the test sample. You can configure and buy the notebook Here. 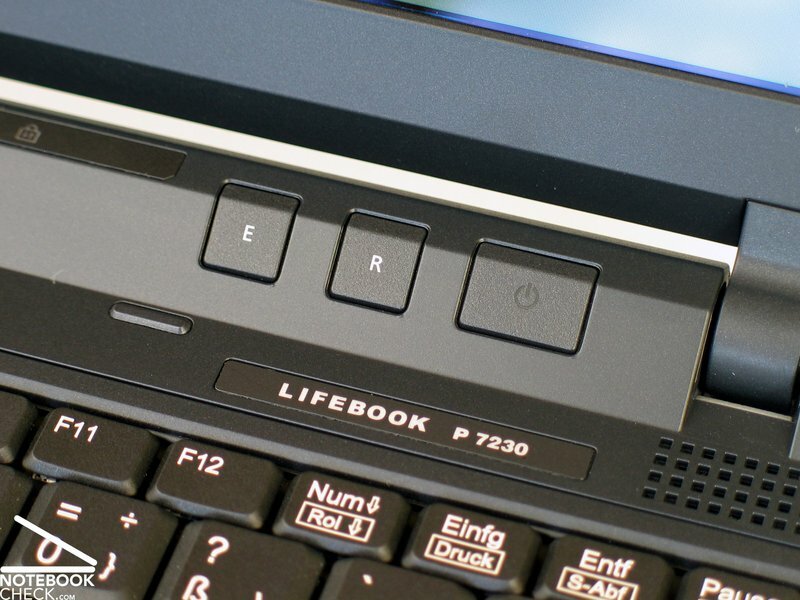 A big plus of the Lifebook P7230 is also the keyboard. ...the keyboard is not only fully functional, but also pleasant to use and ready for extensive writing. 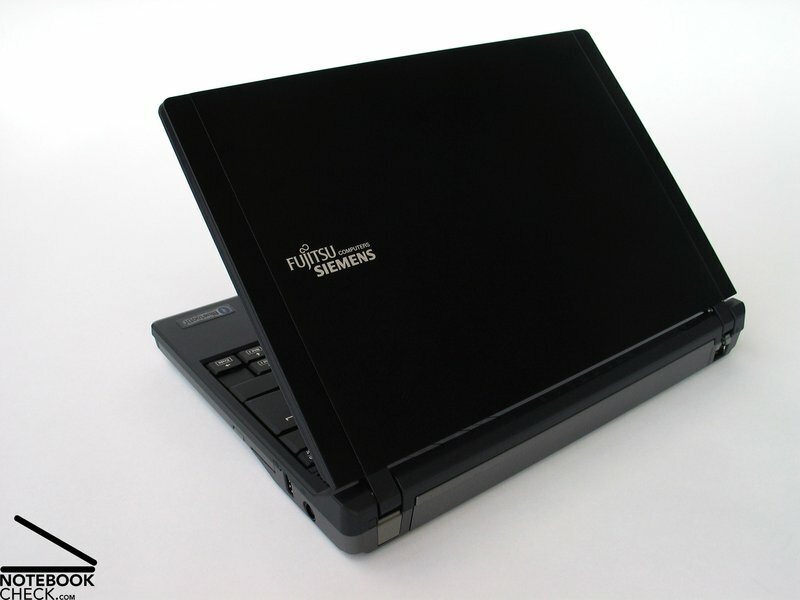 Additionally, the notebook has two extra features, a recovery function as well as an Eco-mode, which can be activated with two seperate buttons. The LED display offers a usable resolution of 1280x768 pixel in 10.6 inch format. Excellent are the brightness and illumination of the display. ...there is no doubt about the main goal of this notebook: Endurance and not performance. This concept is consequently followed, even regarding the built in hard disk. As a result, the fan only sporadically turns on. The temperature stays always at acceptable levels as well. The integrated speakers can just about handle Windows sounds, but earphones are strongly recommended to enjoy music. Even with standard batteries the P7230 manages impressive lifetimes, and it offers the option for an additional battery. 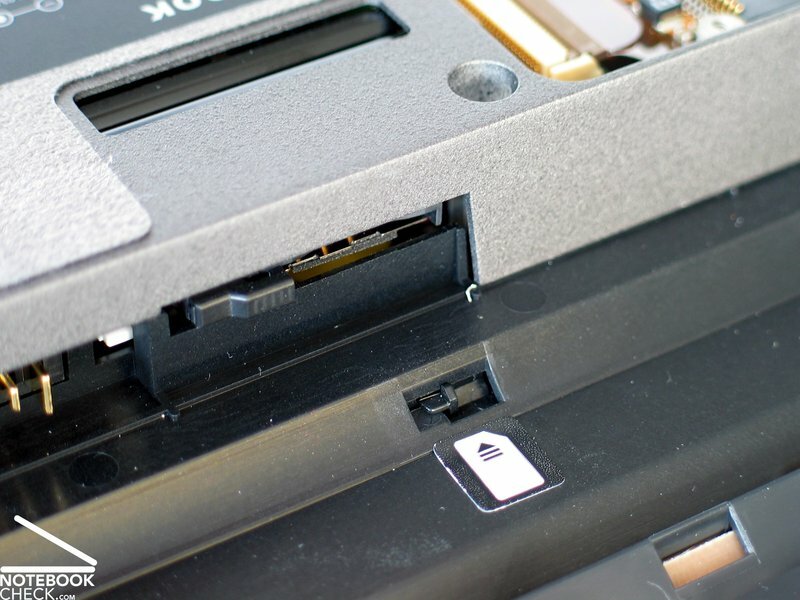 Another interesting feature is the changeable slot, which can either be filled with an optical drive or an additonal battery. ...integrated webcam, can be used for location independend video meetings. Black and grey dominate the notebook's colour design and the shape is strictly conservative. 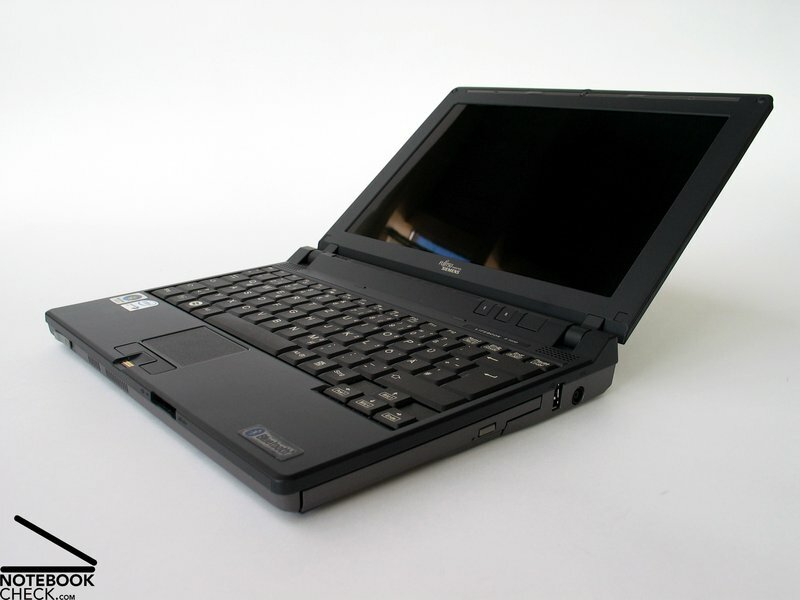 Nevertheless, the P7230's looks good. The same can be said about the feel of the surface of the compact 10.6 inch subnotebook. ...but also an excellent material impression that emphasises the positioning in the high-price segment. Regarding material: A textile cover in leather optic was attached to the bottom side. The case is entirely made of a magnesium alloy, which provides good stability and low weight. 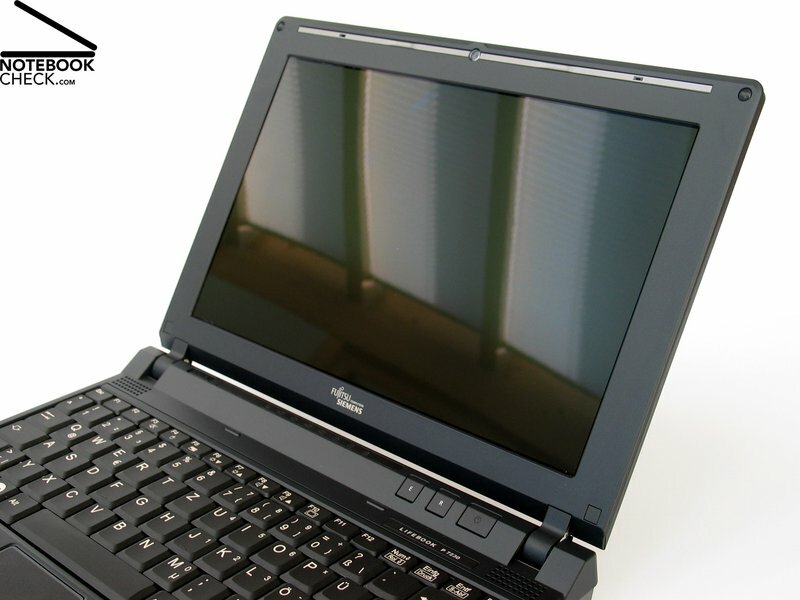 The P7230 can be wrapped into a protective cover (included) in order to protect the sensitive coating of the display lid from finger prints. 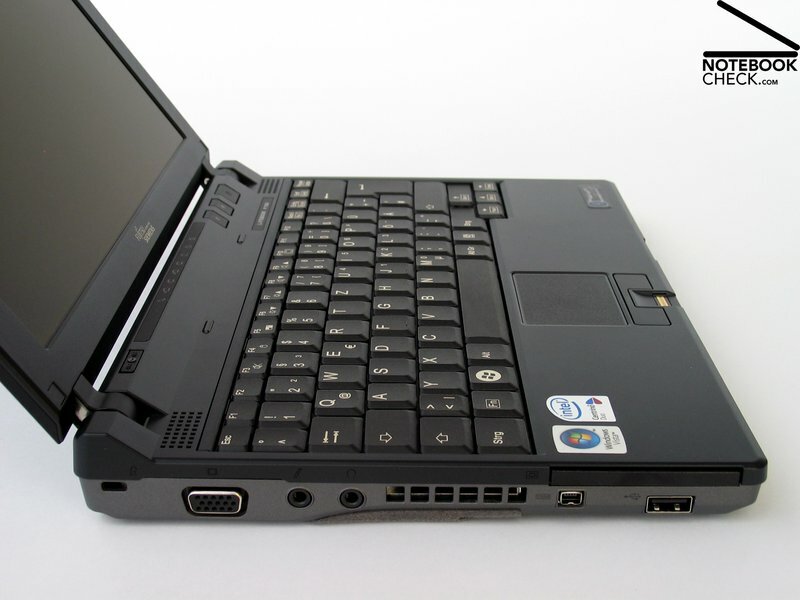 The interface equippment of the Lifebook P7230 is rather modest. 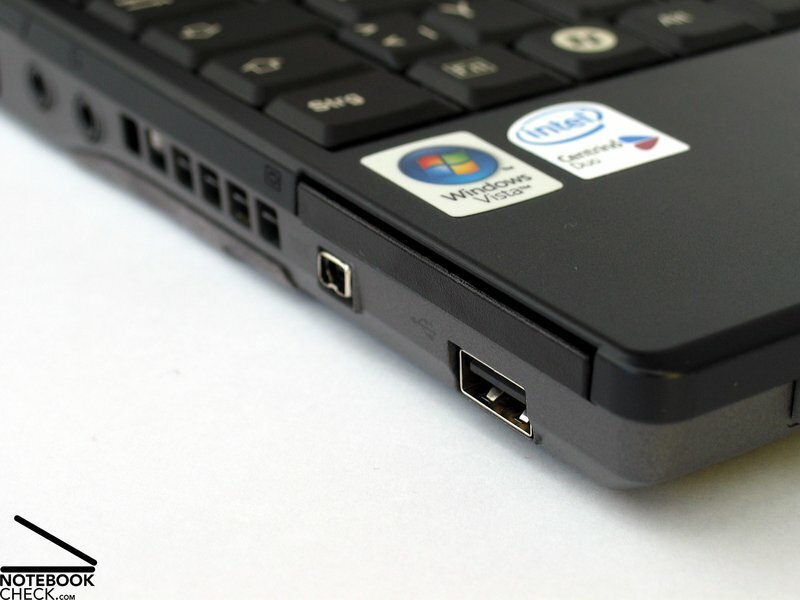 The subnotebook has only two USB ports. At least the order of the interfaces is good and it can be extended with a port replicator. - Weak performance of the ULV CPU and integrated graphics.